Jari Matti Latvala wins Rally Sweden by 16.6 seconds after an epic 3 day battle against former team mate an Citroen driver Mikko Hirvonen. And makes it Ford’s 6th win in a row on the snowy event. Rally Sweden kicked off on friday morning, where Dani Sordo started off the morning leading after the thursday evenings super special. But it was Norwegians Mads Ostberg who took the lead after the first proper rally Stage (SS2). On SS3 Loeb went fastest on his least favorite surface, but only put him up to 5th after receiving a 10 second penalty from being late out of service after some last minute changes to the car. Rally Leader Mads Ostberg only managed 6th quickest, as a result, he lost his lead to Fords Works driver Jari matti Latvala. And this was were the battle started. On the following stage SS4 the short 7.1km kirkener, it was a Citroen 1-2-3 on the stage time sheets. Hirvonen was fastest and closed right up to within 0.6 seconds to rally leader. The 2nd fastest man in the Citroen was Sebastien Loeb. But the most impressive, was the Citroen that was 3rd fastest. It was Thierry Neuville, very impressive time for his 2nd outing in the DS3 World Rally Car. It was on SS5 that Mikko took the lead. On SS6 loeb was fastest and Latvala 2nd fastest, cutting massively into Mikko’s lead, the gap now 0.4 between 1st and 2nd. Drama on SS7 for the 8 times world champion, as he made a rare error and gets stuck in a snow bank, loosing almost 2 minutes and any hope of a decent result in Sweden for the 2nd year running. SS8 and the lead changes again. Latvala Charges through the Finnskogen stage to lead Mikko by 2.6 seconds. On the final proper stage of day 1 Latvala extended his lead over Mikko to 17.2 seconds, but it was Latvala’s team mate Petter Solberg that set the fastest time and moved up to 3rd place, 2.8 seconds behind Mikko Hirvonen. Day 2, There was a good battle for 3rd between Ostberg and Solberg. With Ostberg closing the gap on solberg to 8.8. Both Hirvonen and Latvala pulled away from Petter. Latvala also continued to extend his lead over Mikko Hirvonen up until SS13 were Hirvonen was able to claw back some time, and continued to do so on the short Hagfors sprint and then on to the big Vargasen stage. but only by a few tenths of a second. On SS16 latvala was quickest, then Hirvonen fought back once again on SS17. The 2 fins may have traded stage times but it was Latvala that came out on top to end the day with a 23 second lead. The battle for 3rd was still a close one, but Petter had the upper hand and was 11.1 seconds ahead of Mads Ostberg going into the final day. On the final day of Rally sweden, it seemed that Fords number one, Jari Matti Latvala was unbeatable. Winning the 1st 2 stages on by SS21 had a lead of 35 seconds over Mikko hirvonen. The battle for 3rd was closing up to just 4.9 sconds after the mornings loop of stages, with Petter Solberg just about hanging on to 3rd. On the final loop of stages both Ford drivers hit trouble. Solberg suffered a right front puncture and after the battle with Mads to keep 3rd, the time lost with the puncture dropped him down to 4th. Rally leader Latvala also suffered a puncture, and his 35.6 second lead was cut down to just 8.4 seconds. This put 2nd place Mikko Hirvonen back in the fight with 2 stages to go. But the puncture on SS22 didn’t dent Latvala’s confidence on the next stage, he once again went fastest, and had a lead of 12.9 seconds going into the Power Stage. There was nothing more that Hirvonen could give and worn his tyres down, and admitted that the win was out of reach now. “I had to give up too early in the stage, it was too slippy in the stage and i had a couple of moments earlier”. 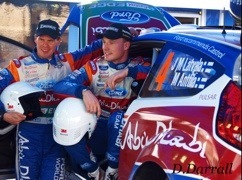 Mads Ostberg cemented his 3rd place over Solberg with 2nd fastest time. It was now all down to the Power Stage to see who could get them Bonus points. Sebastien Loeb hasn’t had the best time out on the Snowy Swedish stages. But made up for his lack of pace and his disappointing 6th place finish on the rally, by going fastest on the PowerStage for them extra 3 bouns points. Fords Petter Solberg made up for his disappointment on not getting 3rd place by setting the 2nd fastest time but was very happy for his team mates result. “With the puncture I am very disappointed, but i am very pleased for Latvala and the team”. The man that fought off Solberg for that 3rd place was Mads Ostberg, and was delighted with his result, “I am very happy, its been a great weekend and I am pleased to win the fight with Petter.” 2nd placed Mikko Hirvonen put up a great battle, but could not keep up with the fast pace of Jari Matti Latvala. “We have learnt a lot this week, but Jari-Matti was very strong this weekend”. A strong weekend indeed. Jari-Matti Latvala drove the perfect rally. And wins the 2012 Rally Sweden. with the 3rd fastest time on the Power Stage for an extra bonus point. The Fin made up for his retirement in Monte Carlo and put himself back into the fight for the championship. Not only was it the Finn’s 6th WRC win, (won his first rally in sweden back in 2008) it was also the 6th consecutive win in a row for Ford world Rally team in Sweden, and the 50th win for M-Sport since the parntership with Ford. “Its really special to have won this again. 4 years ago I became the youngest WRC winner here, beating the record of my great idol Henri Toivonen. 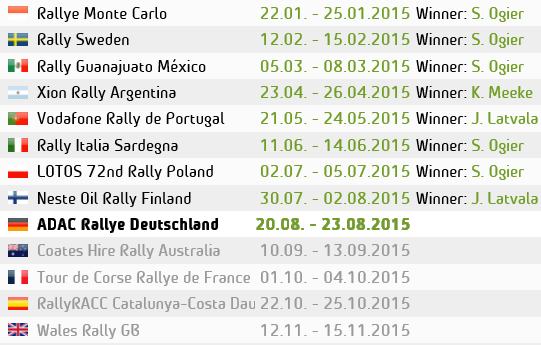 This is the 1st time i have won the same rally twice. Now we fight!” Team boss commented on the 50th win for M-sport and called it “A Landmark Victory for the team”.